Most swallowed foreign bodies pass without complication. Anatomically, the greatest barrier for swallowed objects is the esophagus. In Urgent care settings, X-rays are often taken to determine safe passage through the esophagus into the stomach. Objects that remain in the esophagus need to be removed surgically (via an endoscope). Objects that make it to the stomach, typically pass in the stool without problems. All foreign bodies are not the same. While most objects can be left to pass on their own magnets, batteries, toxic items (ie. those made of lead) and some sharp items require removal. 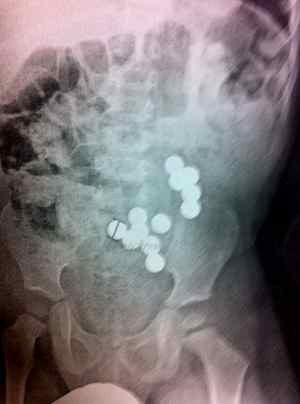 The picture is courtesy of one of my patients who swallowed 12 metal marbles while on vacation. All 12 marbles are seen in the small intestine. The marbles passed without complication about 24 hours after ingested.